- Better understand, participate in, and contribute to the local, national, and global communities in which they live and work; engage critically with societal issues; and evaluate the sustainability of alternative social, economic, political and environmental practices. Globalisation is a series of processes that have caused human activities to become more interconnected and interdependent across the world. The problems of the world have become more significant locally. In the Year 10 Te Ao Whanui programme we are acquiring relevant knowledge, skills and values which enable us to participate and act in shaping our preferred future for a more peaceful, equitable, just and ecologically sustainable world. 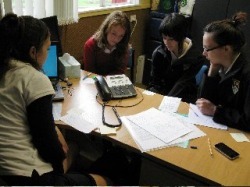 The image shows Heather, Bailey, Dannii and Jessica participating in a phone-conference with Jace Hobbs, our link with the Burmese refugee children with whom we are developing online e-pal relationships. In this way, we not only learn about a real social issue we also hear first-hand from the people who are most affected by the situation; the children themselves. Direct communication means we can be part of the solution and help these children by designing eduational tools to help them learn the English language, which is what they have requested from us. They would also benefit from having old laptop computers so, if you know of a source of these, tell us and Jace will help us send them to the refugee school and arrange for someone to fix them for use by the students.